This page will keep you up-to-date on the latest activities, accomplishments, and initiatives of the OpenDragon Project. For detailed information on the status of OpenDragon software releases, please visit the software status page. Problems registering and downloading the software. We have added instructions to thesoftware registration page to help with these problems, and we have updated the server software. Keep trying! Somehow or other we will get it to you. Adds improved support for images with 16-bit data. Fixes a long-standing problem with Windows 7. This was actually fixed in Dragon Professional more than a year ago, but we have not had time until now to integrate these changes in OpenDragon. Some of the 16-bit sample image data sets have also had some meta-data fixes. The new textbook Learning Remote Sensing Using Dragon/ips® and OpenDragon is now available as a Kindle eBook. To order either the Kindle version or the print version, click here. Because the Kindle does not support color displays, we have created a package of the color illustrations from the book. That package can be downloaded from here. The current download (version 5.10.11) includes Spanish language support for installation and while running OpenDragon. This version includes the complete Spanish translation, and also fixes an error in the character coding of the previous translation. If you downloaded a copy of OpenDragon prior to 24 May 2011, you should download the newer version to get the correct Spanish version. In addition to the Spanish version, the current release of OpenDragon contains newly updated Russian and Thai translations. Many thanks to our Russian, Spanish, and Thai translators for their hard work. Learning Remote Sensing Using Dragon/ips® and OpenDragon is a new textbook which offers a straightforward, hands-on treatment of the core concepts in remote sensing and raster GIS analysis. The book includes detailed descriptions of how either Dragon or OpenDragon can be used to perform a wide range of image analyses common in the remote sensing profession, and includes exercises on each topic. We will be attending in Hanoi, and happy to meet with you. However, we will not have a booth, so please email us to arrange a time and place. We have been testing OpenDragon with Windows 7. There have been a few problems, most of which are fixed in the version 5.10.8 currently available for download. One problem which has not yet been fixed seems to appear only in the 64-bit version of Windows 7, when using the "aero" color scheme. In that situation, the drop down menus on the Viewport do not drop down correctly. You can deal with this by changing your default color scheme (right click on the desktop, then select personal settings). This will also speed up your computer. Alternatively, you can just pass your mouse over one of the dropped down menus to see the menu choices. We expect to have this fixed soon, and will put release 5.10.9 up for downloading. The initial 3-year funding for the OpenDragon Project, generously provided by King Mongkut's University of Technology Thonburi (Bangkok, Thailand) has come to an end. Until new sources of funding are found, OpenDragon continues to be available but with much reduced activity. New software development is halted, and the website has been moved to a new host which is much less expensive, but also much less convenient for Asian users. We are continuing to actively seek new funding. Furthermore, software development of the commercial Dragon/ips is also continuing. 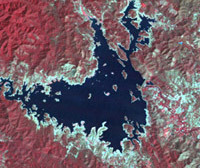 (For information, see: http://www.dragon.rsgis.net). Meanwhile, we apologize for any delays in replying to your communications. OpenDragon Release 5.10 was officially released on Feburary 27, 2007. Minor improvements were added up through release 5.10.5 in July 2007. Highlights of this release include automated image import, georeferenced vector support, and range of new raster modelling operations including slope and aspect calculation, buffering, and conditional layer combinations. OpenDragon will share exhibition space with Dragon/ips (r) at the HealthGIS Conference in Bangkok, Thailand January 14-16, 2008. OpenDragon shared an exhibition booth with Dragon/ips (r) at the 28th Asian Conference on Remote Sensing in Kuala Lumpur, Malaysia in November 2007. Because OpenDragon has no source of funding at that time, the space was donated by Goldin-Rudahl Systems, Inc. The OpenDragon Project had a booth at the exhibition of the American Association of Geographers annual meeting in San Francisco, CA, USA, from April 17-20, 2007. For more information, visit http://www.aag.org. Dr. Sally Goldin presented a paper entitled "OpenDragon: A Platform for Teaching Geoinformatics Software Development" at the 27th Asian Conference on Remote Sensing in Ulaan Bataar, Mongolia, October 9-13, 2006. The paper focused on how OpenDragon and the Programmer's Toolkit can be used by students learning doing thesis or project research, or working in courses on geoinformatics programming. The ISPRS Commission VII Mid-Term Symposium held in Enschede, The Netherlands, from 8-11 May, 2006, included a special session entitled "OpenDragon: Free Geoinformatics Software for Education in Developing Countries". This session included demonstrations of the software and discussions of how to expand its distribution to other regions. Dr. Sally Goldin, assistant director of the OpenDragon project, also spoke speak in one of the symposium's plenary sessions. Kurt Rudahl, director of the OpenDragon Project, presented a paper on the project and its goals during the 20th Towson University GIS Conference, which took place March 20-21, 2006 in Towson, Maryland, USA. This conference has a major focus on geoinformatics education and is one of the longest running and best attended regional GIS conferences in America. OpenDragon Version 5.8 was released on March 6, 2006. This version provides more automatic image conversion, enhanced image metadata, and a variety of functional improvements. On March 6, 2006, members of the OpenDragon Project participated in a meeting with other members of the KMUTT community to discuss whether there was a need for and interest in some kind of cross-departmental center to house geoinformatics engineering research and projects. You can find the slides from Kurt Rudahl's presentation about the OpenDragon Project here. The OpenDragon Project was invited to participate in the exhibition associated with the Thailand National Conference on Mapping and Geoinformatics, December 14-16, 2005. More than 500 attendees had the opportunity to learn about the project. From November 7-11, 2005, the OpenDragon team attended the 26th Asian Conference on Remote Sensing, in Hanoi, Vietnam. We met many members of the Vietnam geoinformatics community, including the Deputy Minister of Natural Resources and Environment, Prof. DrSc. Dang Hung Vo, who was a keynote speaker at the conference. We were particularly interested in informing people about the Vietnamese translation of Dragon, which will be included in Dragon 5.8. On September 1-2, 2005, twenty first year students from Mahidol Wittayanusorn School outside Bangkok came to KMUTT in a pilot program on remote sensing for drought assessment, using OpenDragon. Project personnel led laboratory sessions to familiarize the students with OpenDragon use and capabilities. Experts in remote sensing technology, water resources, and meteorology joined to provide students with the necessary background for them to undertake independent study projects. The students returned to KMUTT three weeks later to present their results. In general, students were enthusiastic about the activity, and had no serious difficulties applying OpenDragon in their work. OpenDragon project personnel presented two papers in the session on Geoinformatics Education at the MapAsia 2005 conference, which was held in Jakarta from August 22-25, 2005. Kurt Rudahl discussed the OpenDragon Project goals and why OpenDragon is appropriate for education. Sally Goldin described our innovative course on computer programming for geographers that was developed for Chiang Mai University in mid-2005.